a small terracotta pot filled with bright red chrysanthemums. a wonderful way to show her how much y ou adore her. this small terracotta pot filled with gorgeous white and purple chrysanthemums will light up any roo m and is perfect for any occasion. her cup of love will runneth over when she receives this small token of love. designed in a coffee m ug that she can use at the office afterwards, this gesture of love includes 4 red roses and a few me lt-your-heart lindt chocolates. 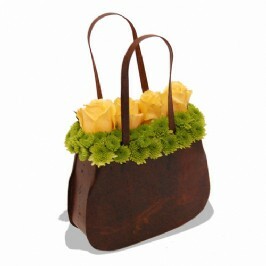 an enchanting little handbag arrangement that'll captivate your imagination; with red, peach and pin k gerberas that smile whimsically at you between bright sunny goldenrod and leafy-green ruscus. 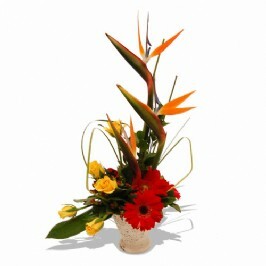 her cup of love will runneth over when she receives this small token of love on valentine?s day. des igned in a coffee mug that she can use at the office afterwards, this gesture of love includes 4 red roses and a few melt-your-heart lindt chocolates. let her know she's the one with this funky and fun valentine arrangement mixing cerise pink and red roses in a red and white polka dot and striped box. for someone funky, fun, fresh and quirky. this beautiful flair vase is filled with gorgeous orange lilies, orange roses, yellow mini carnation s, green chrysanthemums and purple michy daisy. 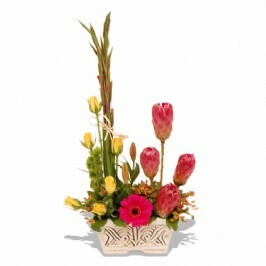 with the vibrancy of cherry-red roses, wine red chrysanths and lime green button spray, this pottery planter arrangement packs a punch that says... aaah... mon cheri! 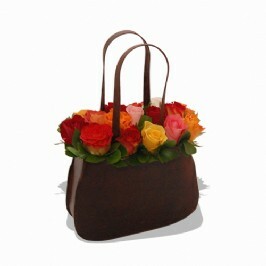 this charming little handbag arrangement is a perfect mix of scented rosebuds, silky stocks and char ming chrysanthemums all delightfully set in a bed of fresh greenery. 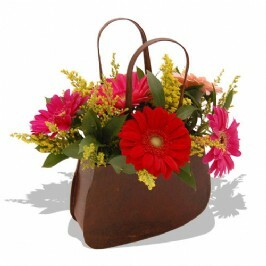 this gorgeous little watering can is beautifully made up with strelitzias, white roses, red gerberas and pink & yellow chrysanthemums, perfect to spoil mom with. set in a rusted metal handbag, these lemon-fresh rosebuds peep out from a bed of lime green mini-mum s to create a chic little arrangement that's oh-so-mod! this bouquet is filled with warm coloured yellow roses and orange lilies and is a wonderful way to b righten up that someone special's day. a beautiful pink bouquet consisting of pink lilies and pink roses. keep the romance alive this valentine?s day with this modern floral arrangement in a galvanised meta l bucket that can be re-used for growing herbs in the kitchen afterwards. if life gives you lemons, make lemon sorbet! 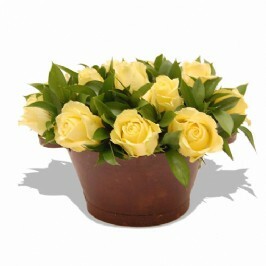 this rusted galvanized metal bucket is filled with sump tuous scoops of lemon-fresh roses that tantalise you from a bed of fresh green leaves. selected area s. container may vary. 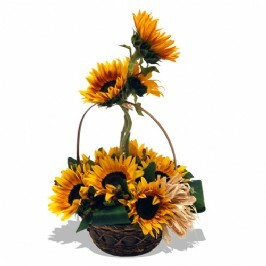 this basket of gold at the end of the rainbow is filled with magnificent sunflowers rising up to smi le their golden smile. funky fashion at it's best! this fabulously cute little handbag is filled with brightly coloured ros es framed with fresh green leaves to create a gorgeous little gift for any fashionista! an oval-shaped metal bucket packet full of lolly-pop-fizz-whopping fun! 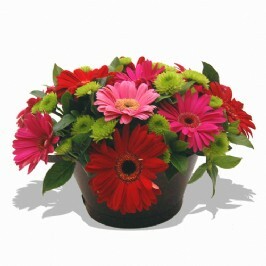 these fuschia-pink, cherry-r ed and strawberry-blushed gerberas with apple green mums will brighten up a gloomy room with glee. be bold. be different. be true to yourself. this stylised arrangement is strong, alive with colour a nd vibrant with movement.please note that occasionally strelitzias may be unavailable, where a subst itute will be made. 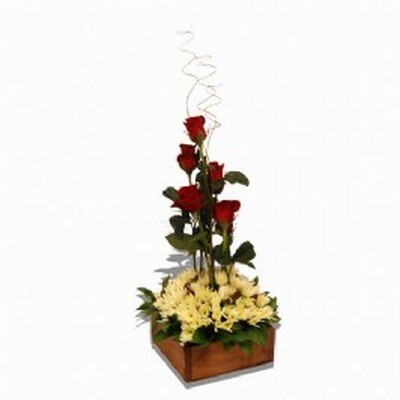 this weapon of mass seduction is sure to get her heart racing as you express all that your heart des ires. 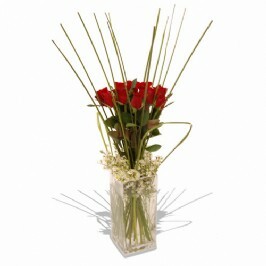 12 long-stemmed deep red roses with pure white michy daisy and razor-sharp steel grass forms a powerful arrangement that 'awakens the senses'. Shopprice is always committed to save every cent of your hard earned money by finding the best and the lowest prices, best bargains and hot deals on fresh flowers that fits your budget and requirements. Helping you to get the best deals on fresh flowers on various special occasions like Christmas Day, Fathers Day, Mothers Day, Foundation day and so on.